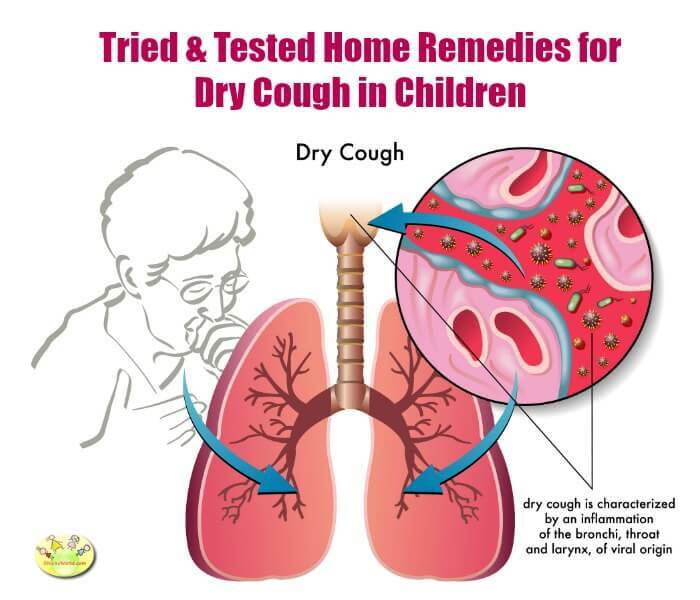 How to relieve dry cough in children? We all know how often little ones are attacked by cold and cough. There are many reasons for increase in cases of dry cough, one of the biggest being high levels of pollution and allergens in the atmosphere. Dry cough is different from chesty cough in that it is no-productive. Dry cough is the kind of cough which does not produce any mucus or phlegm with it. Most often dry cough is caused due to irritation at the back of the throat. It is persistent and is associated with a tickly throat. Dry cough is often caused infection by cold and flu viruses in the atmosphere. It can also be caused by pollutants in the atmosphere which cause irritation in throat. Allergens like cigarette smoke, vehicular smoke and pollens can also trigger dry cough. Dry cough may also be caused due to side-effects of medicines taken during an illness. Dry cough can be consistent and using over-the-counter cough suppressants frequently is not often good. There are plenty of things available within our kitchen which can be used to create cough suppressants and soothe itchy throats. Here we have collated some very effective remedies for dry cough and itchy throat. We have received many of these from our readers and we thank them all for contributing these. This is a tried and tested remedy for dry cough that I always make for my daughter. It is also very good for their immunity during winter time. We have also shared this detailed recipe on our Youtube channel. Do watch the video below. Mix every thing in a bowl and knead together. If the mixture appears a little dry, add a few more drops of ghee. Give 1-2 of these balls before sleeping for relief from dry cough. This is a simple home remedy which gives quick relief from a tickly, irritated throat and also relieves dry cough. I frequently use this remedy for my family whenever we have dry cough. Mix lemon juice and honey and give this syrup to child 3-4 times a day. P.S. You can also add honey and lemon to a glass of warm water and give it to child every day for better immunity. This home remedy for dry cough is also quite common and well tested. This works for children who are a little older as ginger is a little strong. This remedy works for adults too. To get ginger juice, grate or crush a piece of ginger. Now squeeze out the juice. Mix 2-3 drops of this juice with honey and give 2-3 times a day. Jaggery, carrom seeds or ajwain as well as turmeric provide warmth to body and soothe throat, thus providing relief from dry cough. Add turmeric and ajwain seeds and mix everything till jaggery melts. Make small balls of this mixture and give 1-2 of these to child 2-3 times a day. This is a very common remedy and it treats sore throat like nothing else. It moisturises your throat through osmosis and thus provides relief from dry cough. It also removes irritants and thin down the mucus. Take 1 cup (around 250 ml) of warm water. Water should not be too hot. Use this solution to gargle for about 30 seconds and then spit it out. Repeat till you finish the water and rinse your mouth with normal water. You can gargle in this manner 2-3 times a day till you have complete relief. Turmeric is a wonder spice which has a chemical compound called curcumin. It has antimicrobial, antiseptic and anti-inflammatory properties which help in getting rid of coughing caused due to viral infection or allergies. Haldi wala doodh is an age-old remedy which provides relief from cough and cold as well as other minor ailments. It is also helpful in improving immunity. It is now acknowledged world-wide in the form golden milk. Heat milk in a pan and bring it to a boil. Add turmeric powder to this and mix well. Add crushed black pepper and stir for a minute on simmer. Pour it in a glass and give when warm. P.S. If your child does not like as is you may also strain it and add a little sugar. Hope these home remedies for dry cough help your child and your whole family! We would love you to share your own remedies too, so it can help everyone! If you like this article, do share it in your circle. It helps us stay motivated. Do leave a comment to ask a question or let us know your feedback. You can follow us on Facebook, twitter , pinterest and Youtube. How to Make Gond ke Laddu? Very good remedy, Susila. Thanks for sharing! Do you have an actual book published? No Ketki, we do not have these in a book.